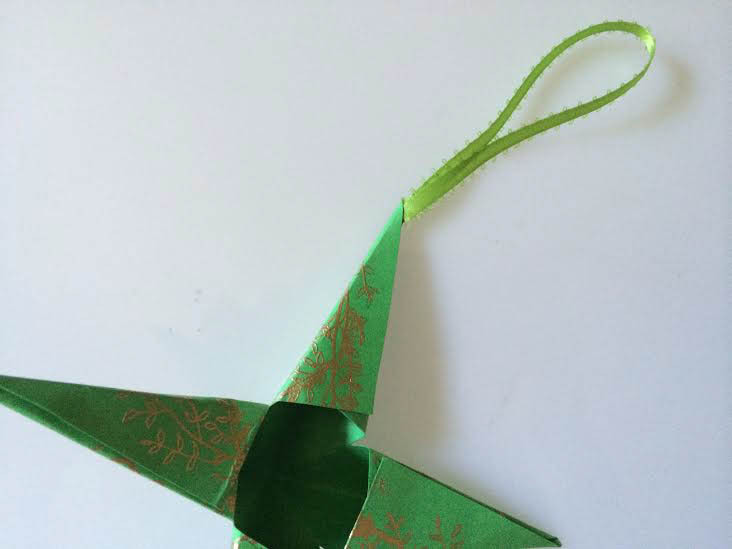 I was stuck at home sick today, and for whatever reason (maybe to combat the flu-melancholy), I got into the mood to make hanging paper stars. I searched online and chose a few I really liked, and decided to share them here with you. 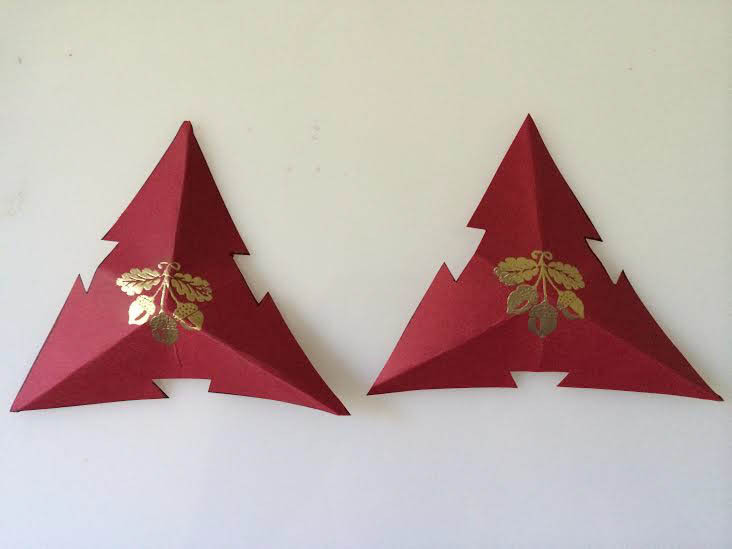 These stars are really festive, and especially great for the winter and holiday season. 1. 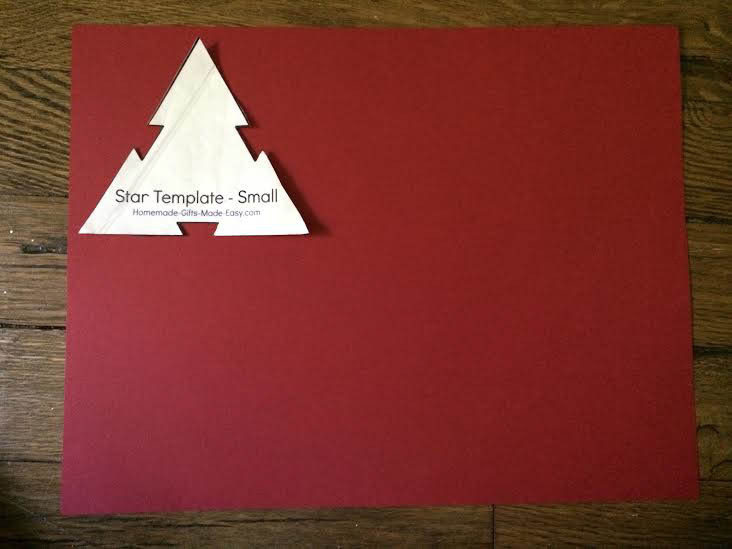 Start by printing out this star template by Homemade Gifts Made Easy. I used the size small to make this one. 2. 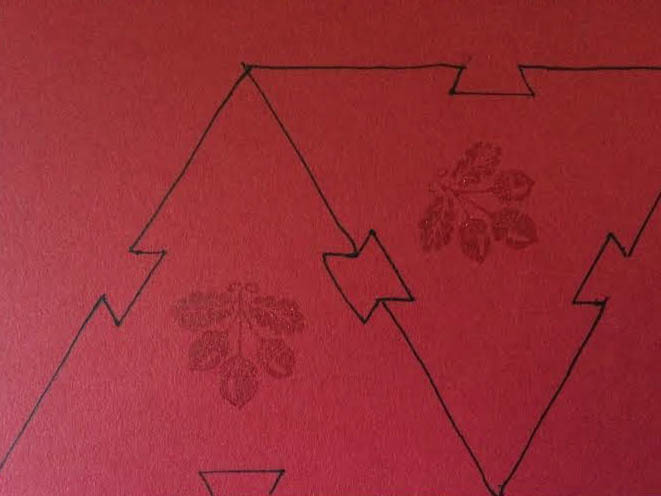 Trace two of these templates onto the paper. 3. 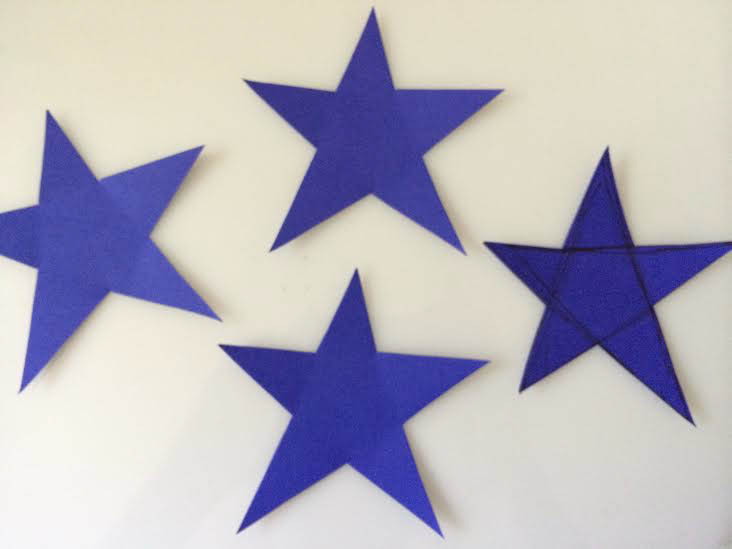 (Optional) I used heat embossing to decorate these stars. 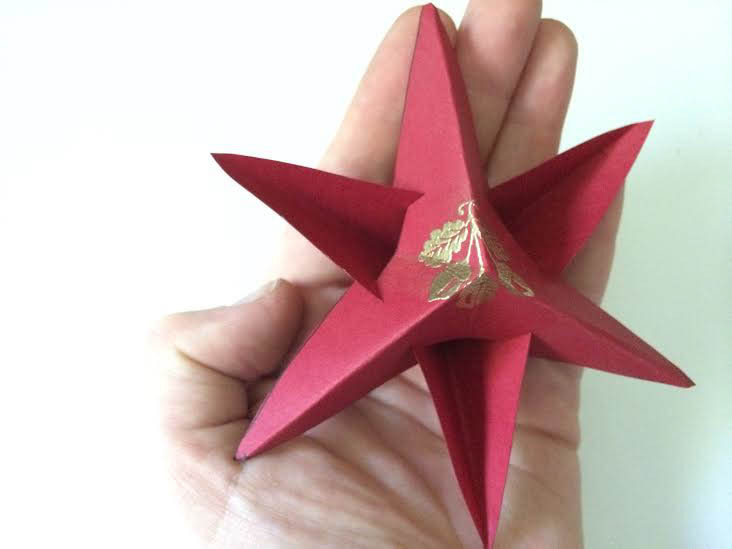 For this star, I took an acorn stamp from the Martha Steward collection and my VersaMark embossing pad to stamp both star halves. 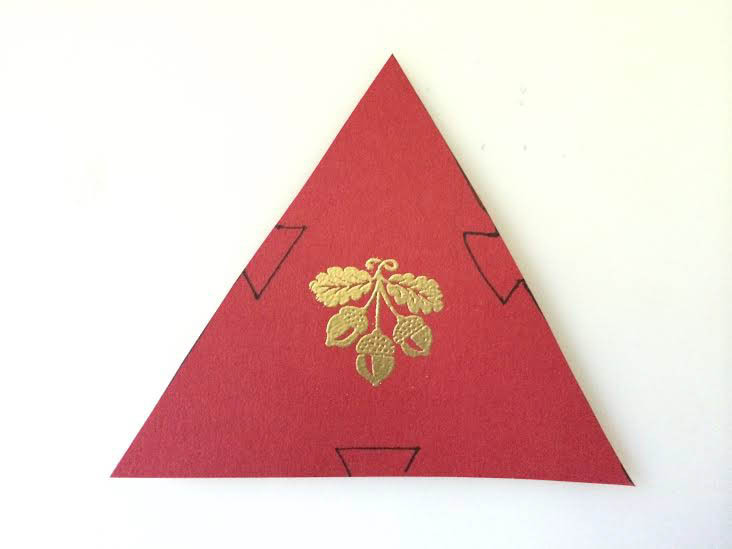 I then sprinkled them with my gold embossing powder from Paper Source and used my heating tool to finish the job. 4. 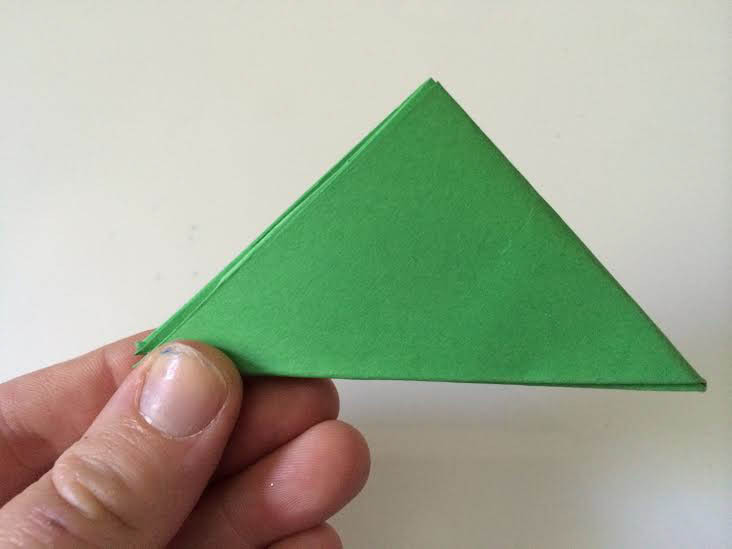 Cut out each of the triangles. 6. Press both of the stars so that each of the three gaps line up. 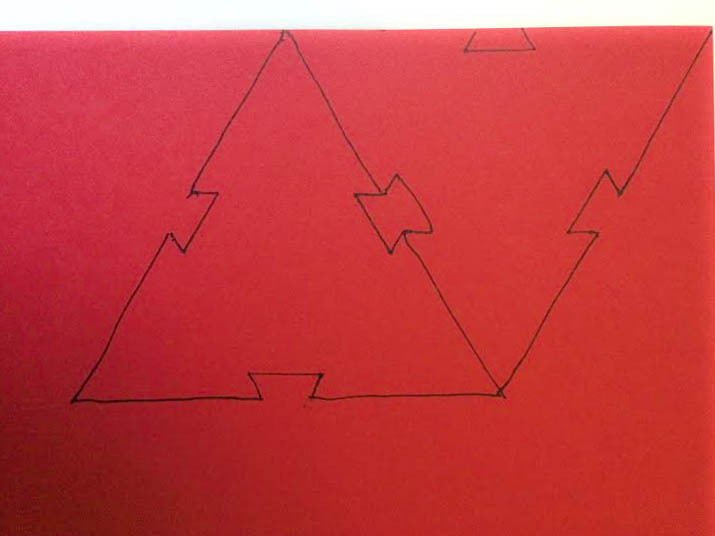 Have the two triangles “kiss” by lining them up at the gaps, and release so that they fill into a star. 7. 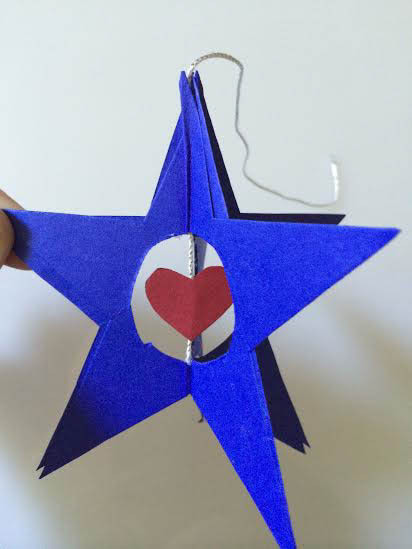 Punch a hole in the top of the star so you can hang it with ribbon. 1. 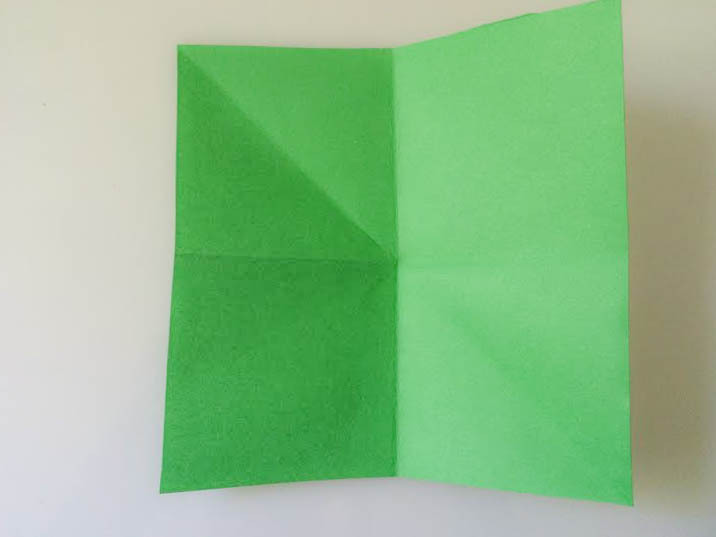 Cut two square pieces of paper. 2. Fold in half, hot dog-style. 3. 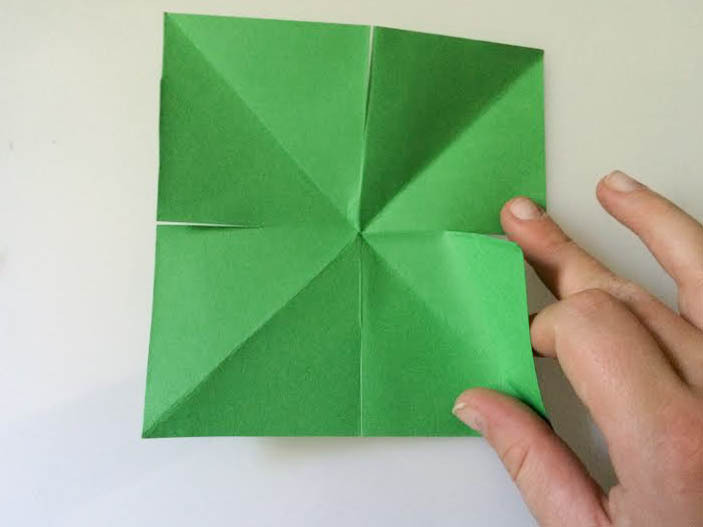 Fold in half again, hamburger-style, to make it a square. 4. 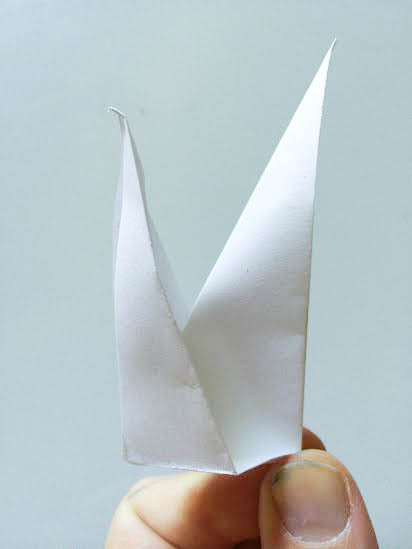 Fold again to make a triangle. 6. 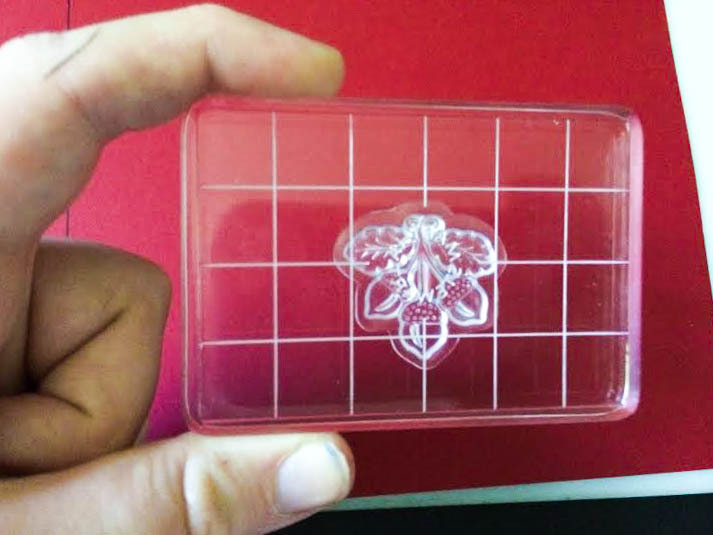 (Optional) Heat emboss for decoration. 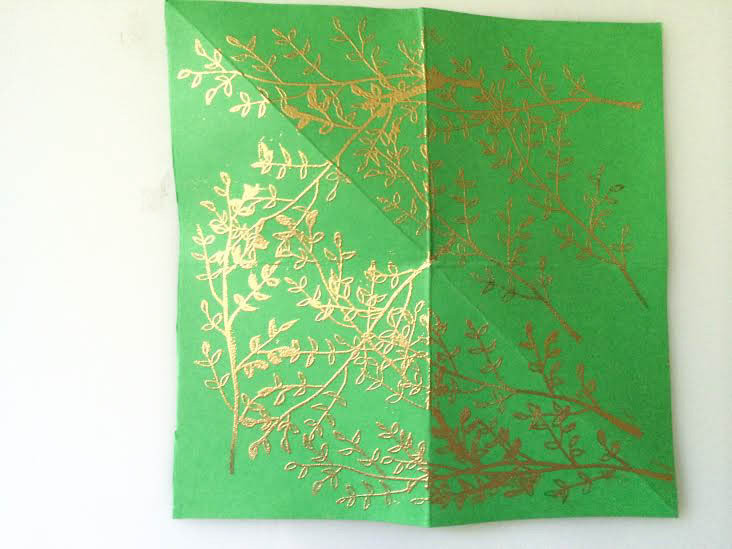 Here I used a branch stamp from Paper Source with my VersaMark stamp pad, gold powder, and heating tool. 7. 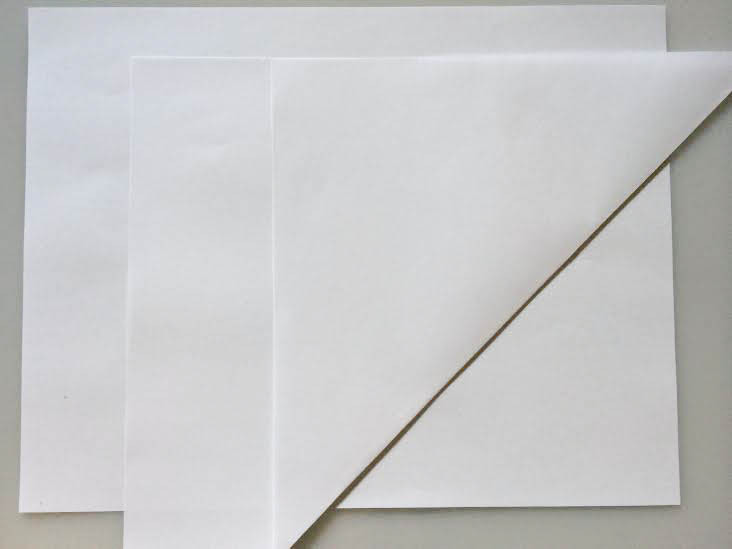 Cut slits half-way up the four straight folds; i.e. 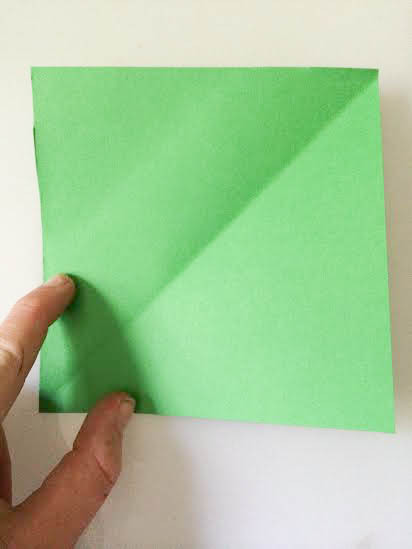 those at a 90-degree angle of the paper’s edge. 8. 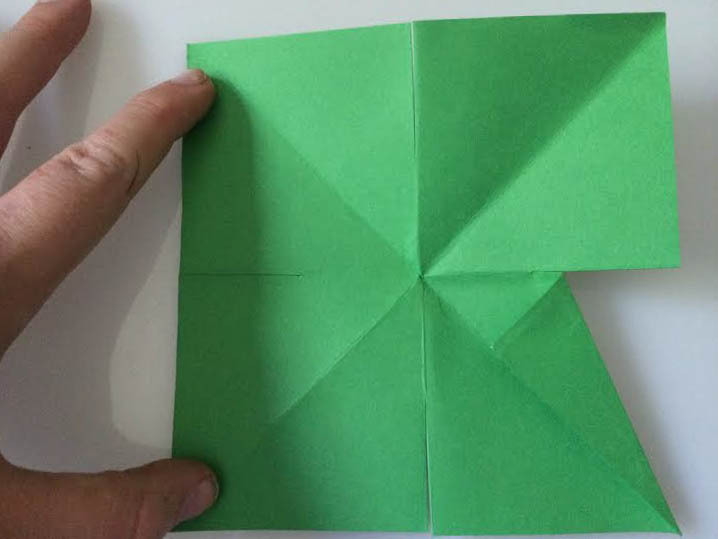 For each of these four corners, fold both of the sides inwards to the line running diagonally through the square. 9. Do this for all four corners, until both halves look like this. 10. 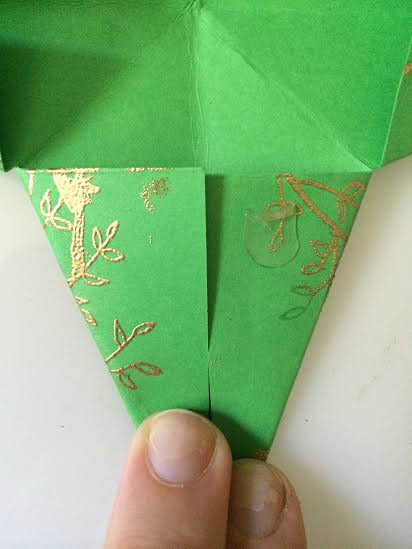 Here’s the fun part: place a glue dot, or a small dab of glue, on one of the folded flaps for each point. 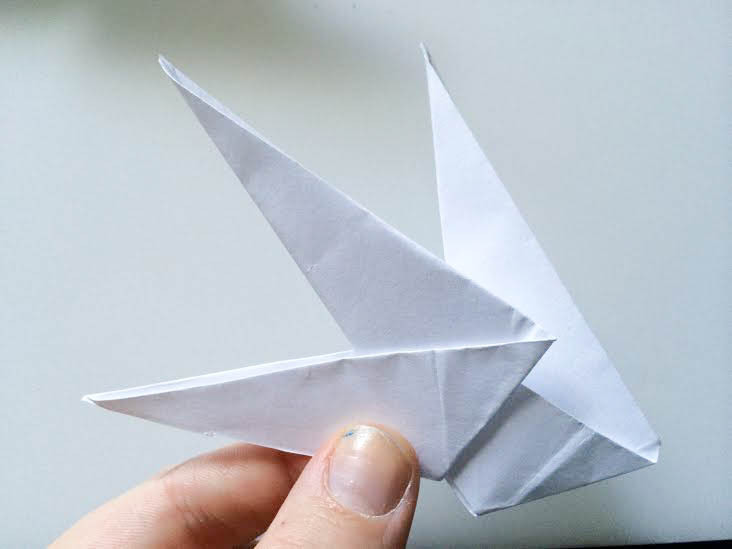 Place the other flap on top of it, creating a 3D point. 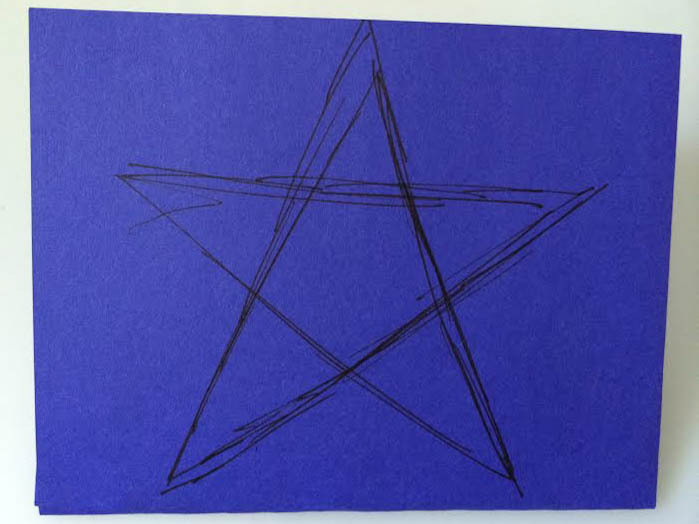 Do this for all points on both halves of the star except one. 11. 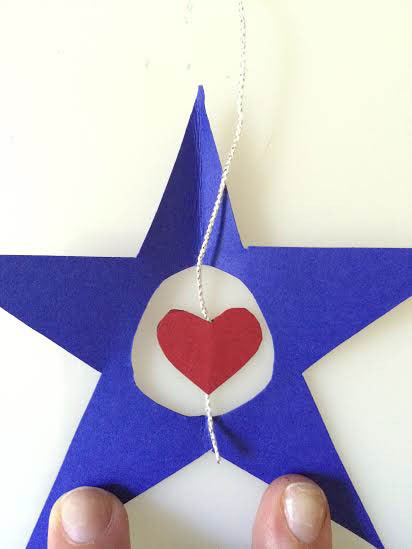 Cut a piece of ribbon that you can use to hang the star and knot it. 12. 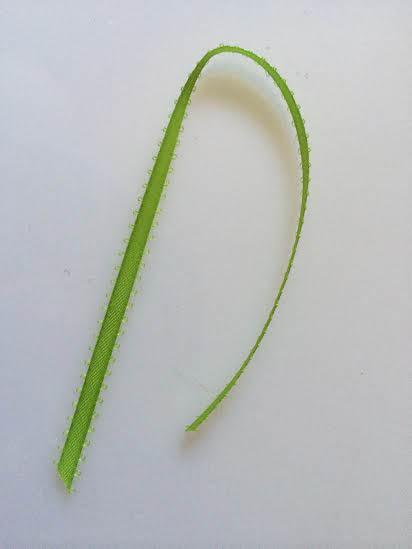 Take another tab of glue or glue dot to place the knotted end within the final point, creating a ribbon hanger. Now glue the final point as you did the others. 13. 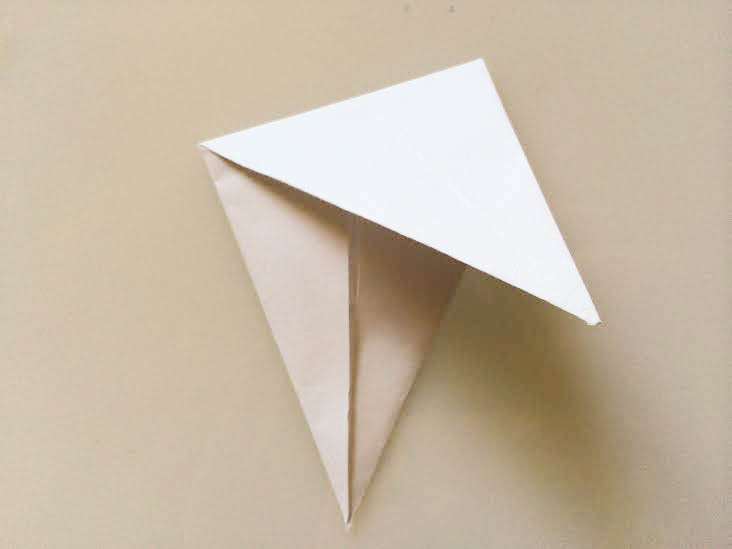 Attach the two halves together using glue or glue dots. 1. 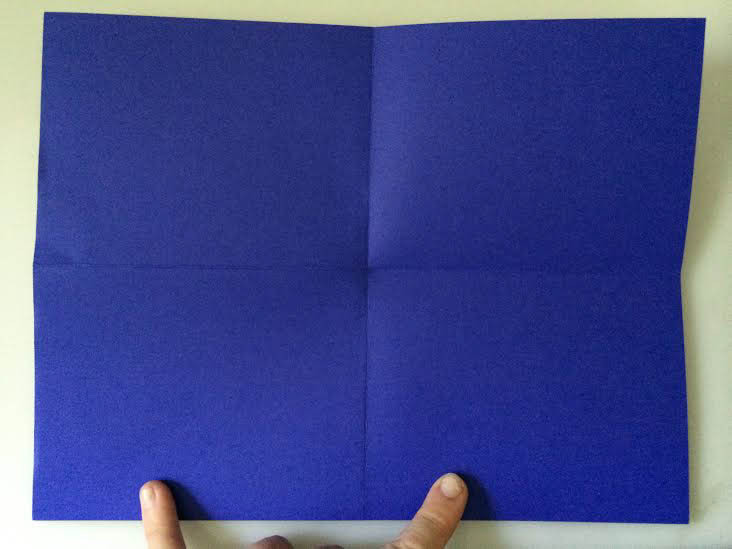 Take an 8 x 11″ piece of card-stock paper and fold it into fourths. 2. 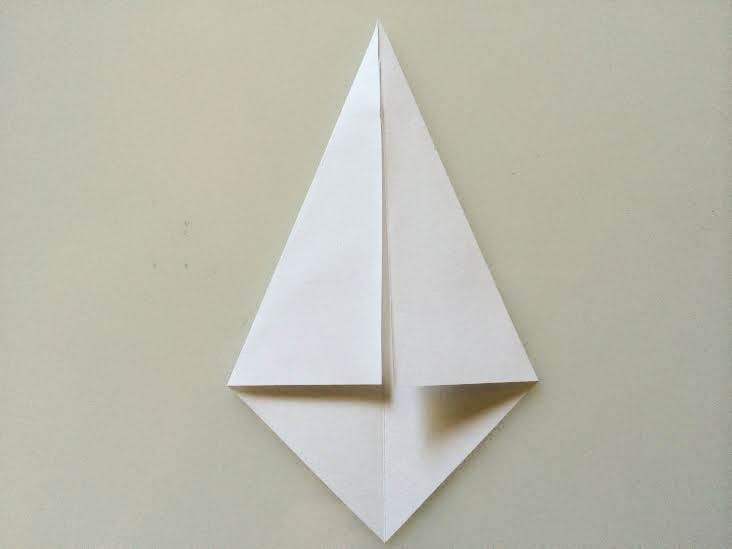 After folding the paper into four pieces, as shown above, sketch or trace a star onto it. 3. 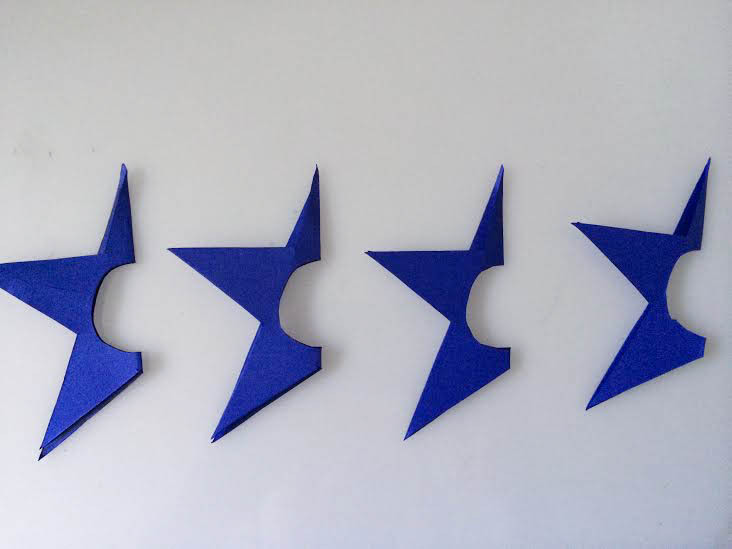 Cut out the star shape, creating four identical stars. 4. 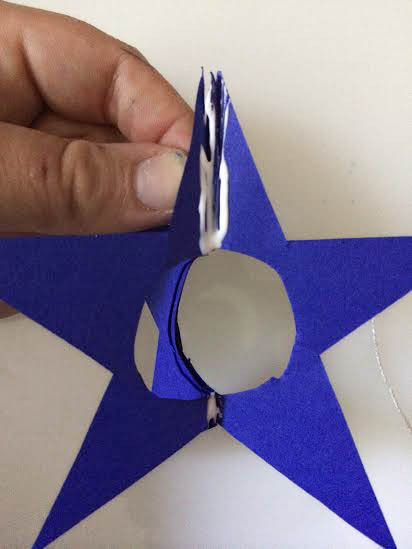 Fold one of the stars in half and cut out a circle from the middle. 5. 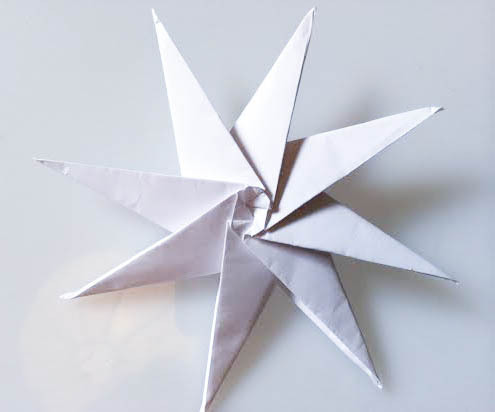 Fold each of the other stars in half as well, and use the cut star to trace out a half-circle shape on each of the others. Cut out the circle for each. 6. 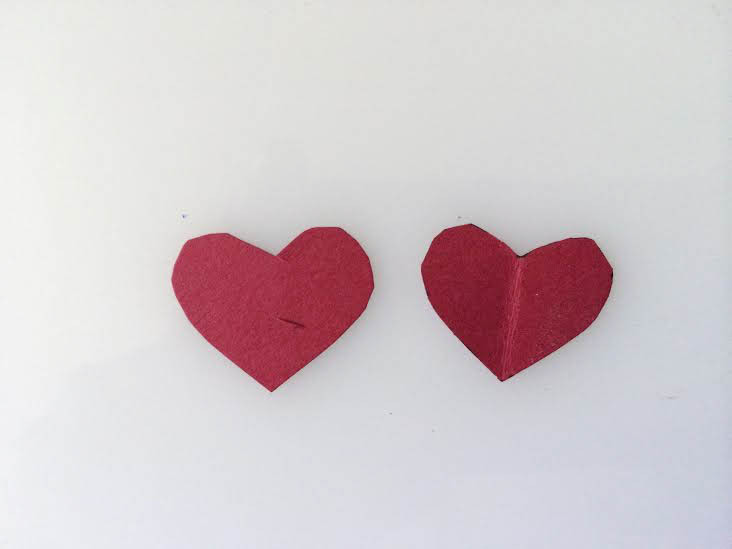 Next, cut out two small identical hearts. 7. 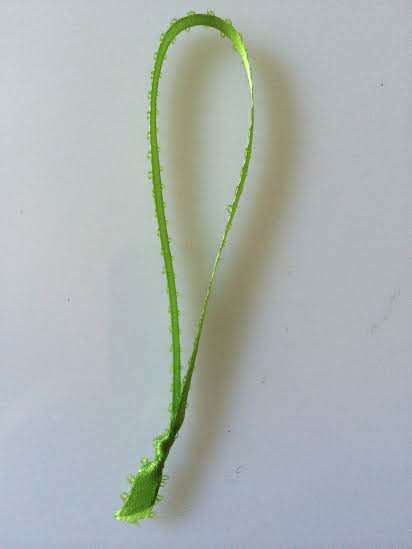 Using the glue stick, cover one of the hearts with a thick layer of glue. 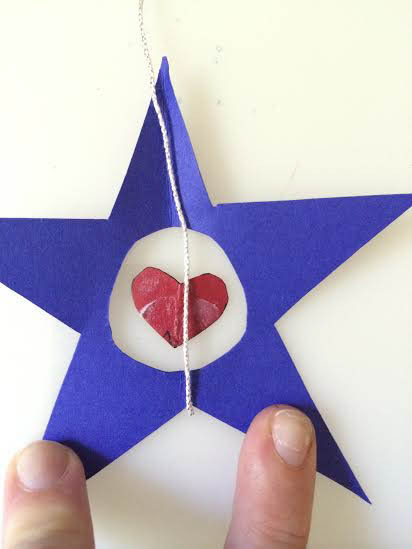 Frame the heart with the star, and measure the string over it to approximate the length you would like. 8. Place the other heart on top of the first, and press down firmly. 9. 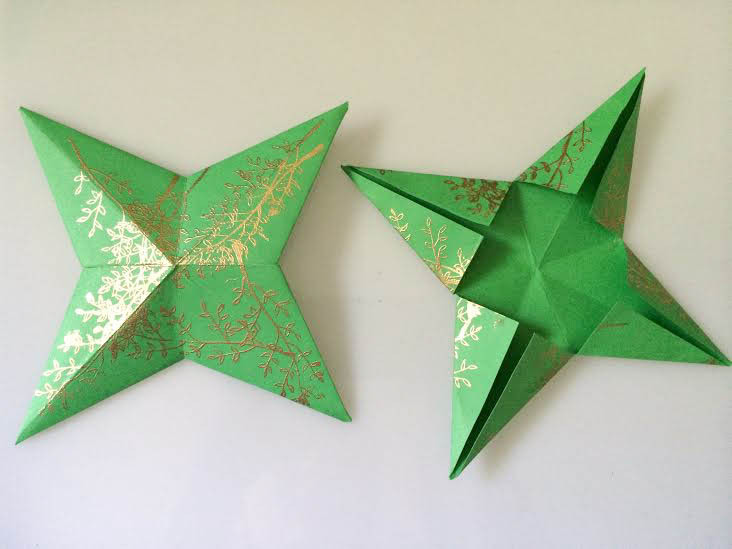 Begin gluing the sides of the four stars against each other to create a 3D shape. 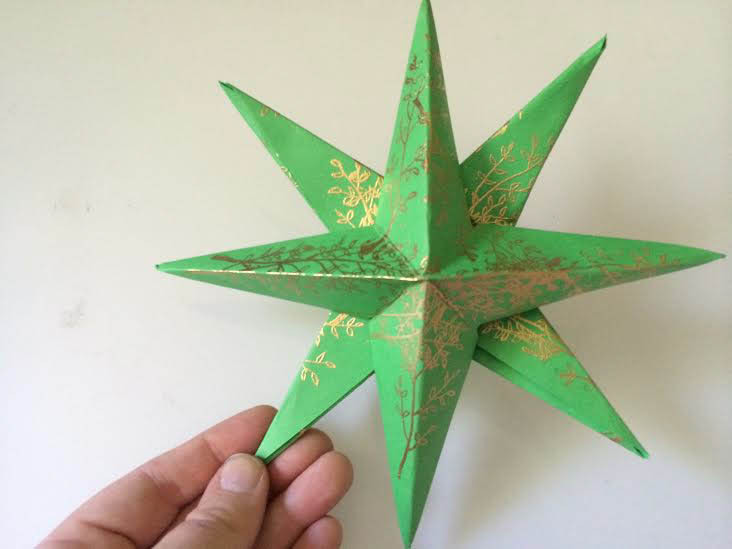 After you have glued three of the stars to each other, take your bottle of glue and create a thin line along the top and bottom of the folded area. 10. 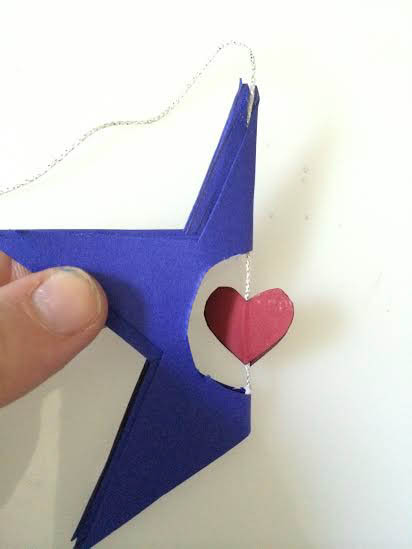 Place the string with the heart into this glued area. Glue the last of the four star cut-outs in place. 11. 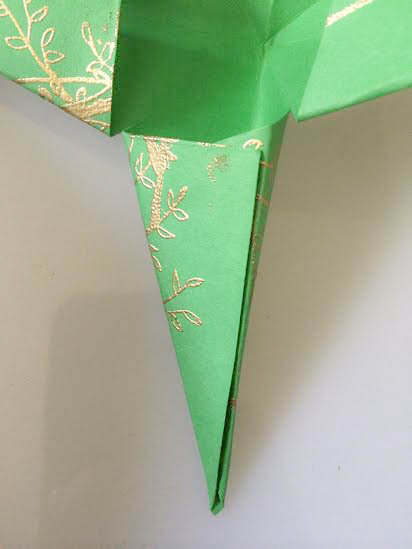 Press the star under something heavy, like a box or a book, to let it dry. After 10-15 minutes, release it and allow it to take its full shape! 1. 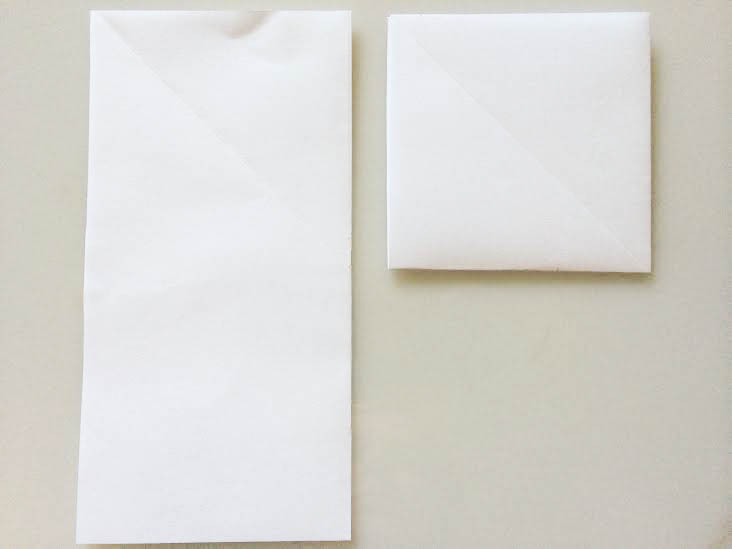 Cut both sheets into squares. 2. 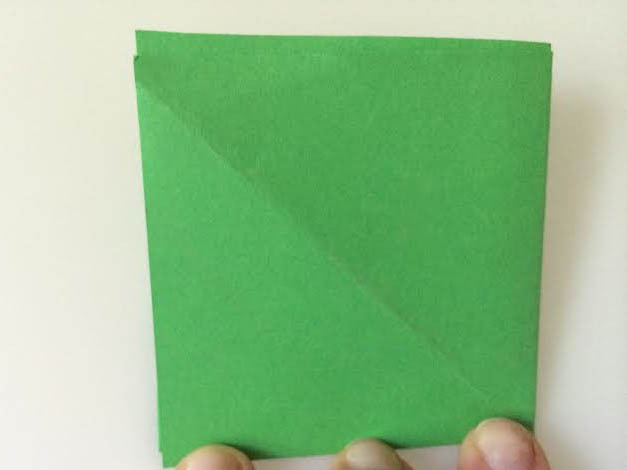 Fold the pieces of paper into fourths, and cut along the straight lines so you end up with a total of eight small squares of paper. 3. 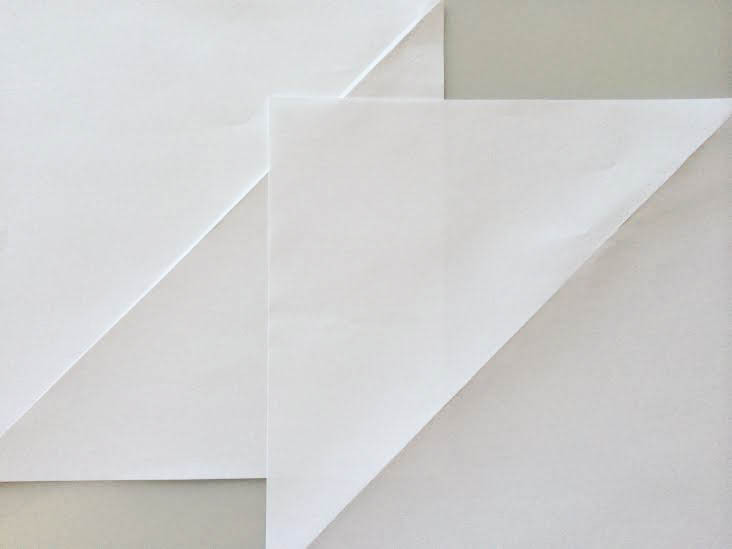 Fold each of the small squares diagonally. 4. 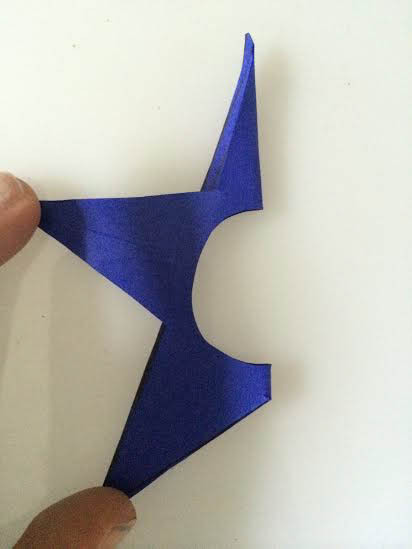 Fold each side corner inwards so the edge lines up the fold line in the middle. 5. 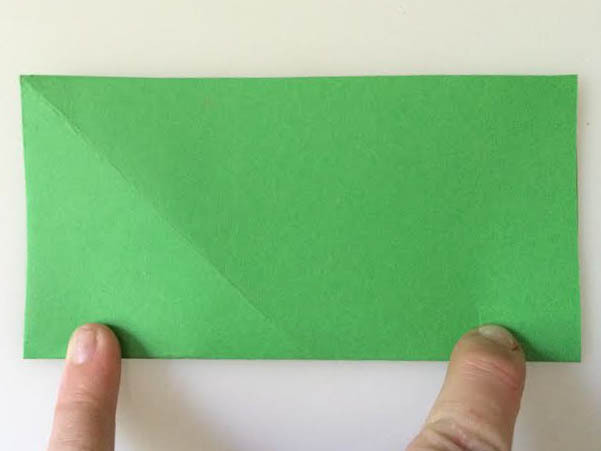 Fold each bottom corner upwards toward the middle fold line. 6. Do this for all eight sheets. 7. 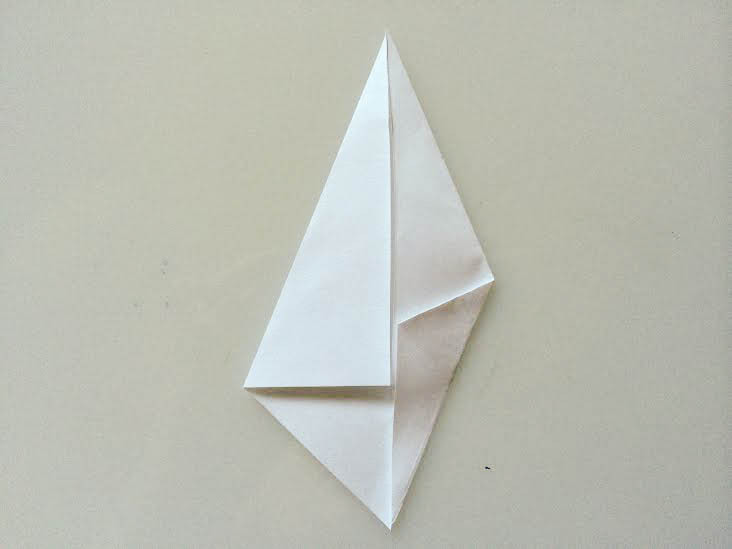 For each diamond, fold the top corner downwards, diagonally to the right. 9. 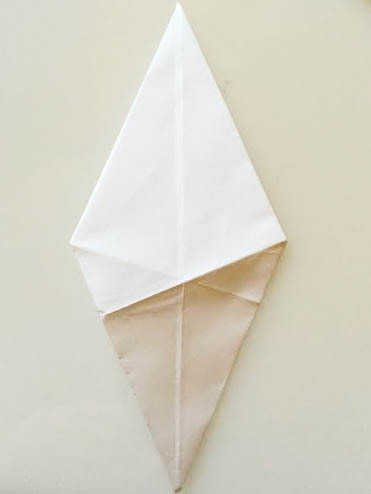 Fold the diamond upwards to form this shape. 10. 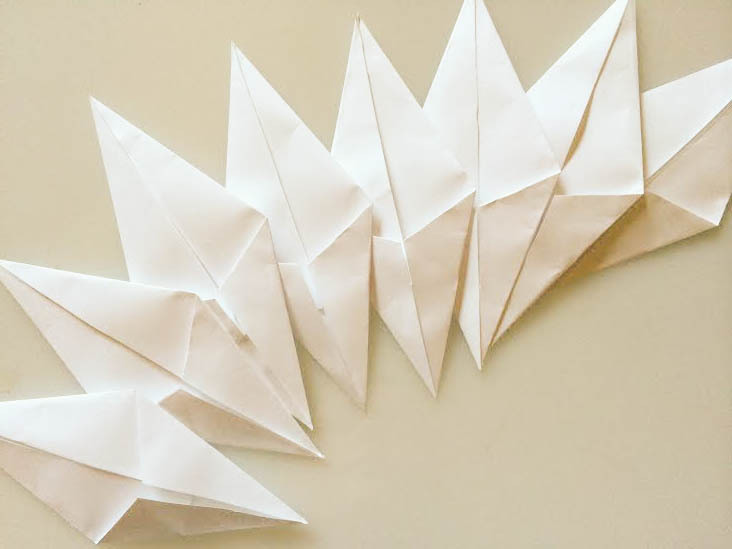 Now slip each of the folded pieces into each other. 11. 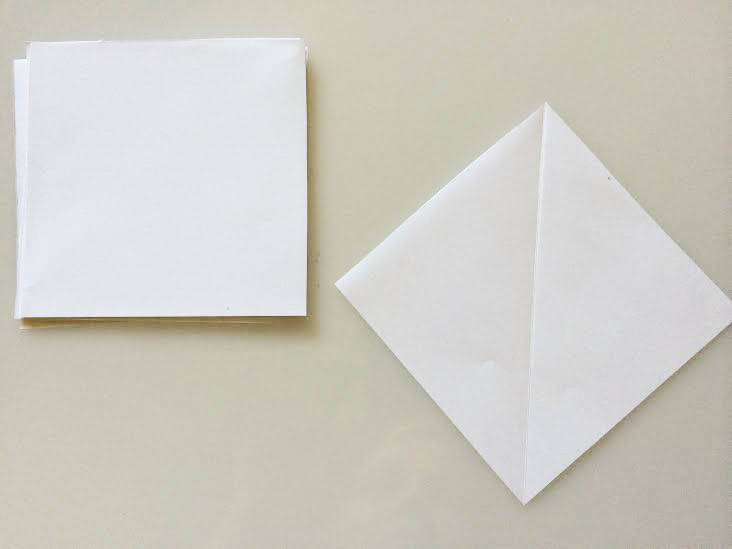 Once you have slipped all eight into each other, take the shorter end of the first diamond and fold it into the longer end of the last diamond, making a star. 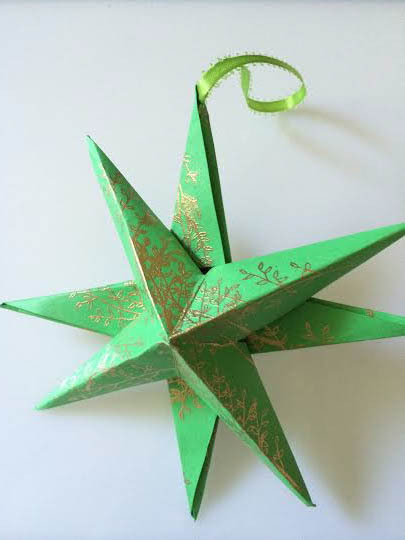 Making the star look nice at the end may take a little wiggle work, but after a minute or two it should form this beautiful flat folded shape!